On About.com's Quilting forum, an ugly fabric swap was started. I didn't participate in it but did enjoy hearing about it. One of the ugly fabrics was of this incredibly disturbing puffer fish with realistic human eyeballs and teeth. It was SO ugly it was attractive .... kinda like the car wreck that you know you shouldn't look at but you can't stop yourself. The participant who had the ugly puffer fish fabric was mentioning that she had some left (OMG, there was MORE??) and when I asked her if I could have a swatch of it, she very graciously sent me an (approximate) 18" x 18" square. The fabric was more disturbing in person that one could possibly imagine. To truly appreciate this design, you must see it in full size (be sure to take your anti-seizure medication prior to opening the link). The puffer fish are about 7" in diameter, a lovely gold color on a soft green background and, in addition to the eyeballs and teeth, are covered in hundreds of vicious spikes. The fabric itself has a very nice suede-like feel, perhaps it's micro-fiber. I thought about fussy cutting the puffer fish, but ya know, something this obnoxious really needed to be kept intact. And so, I made an enormous throw pillow for the Pirate household. This time, I remembered that I ought to quilt the fabric BEFORE it gets made into a pillow cover, so I loaded it onto Lizzie and kinda/sorta outline stitched, in SILVER thread, all the spikes. My puffer fish have bling! 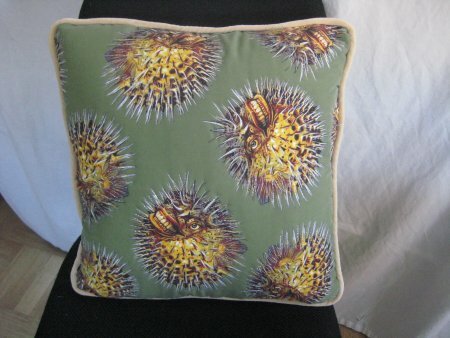 :-) I decided not to stipple between the puffer fish because that would ruin the really lovely suede feel of the fabric. In my rummaging in my stash for something else, I re-discovered some moss colored upholstery velvet that appeared to be big enough for the back. Alas, upon closer inspection, I discovered that it was just slighly too narrow BUT I also re-discovered a small amount of some ecru/light tan velvet which I cut strips from and sewed them to the upholstery velvet to create a backing that was large enough. Fat piping was covered in more of the ecru/light tan velvet. A zipper at the bottom of the pillow cover facilitates removal for laundering purposes.